Pundak Kiwo waterfall is located Ngancar village, Plaosan District. This Pundak Kiwo Waterfall as part of Waterfall tourism object area that developed by Magetan regency government. Pundak Kiwo Waterfall is located in the topmost part of all waterfalls in Ngancar village and become the big and high waterfall with the height about 45 metres. If see from the bottom, this waterfall is located at the left side of the mountain, so that it is famous called Pundak Kiwo. Stepping the way back from the line of waterfall arrangement, we will find a sanscript that is called Watu Ongko ( Watu means rock, and Ongko means number ). This sanscript is the heritage of Majapahit Kingdom. This is a written stone and an old grave that is cared by the society and used for ritual ceremony. The other enchanment of this place is Anggrek Macan ( Anggrek means Orchid and Macan means tiger ) that lived in around Waterfall. 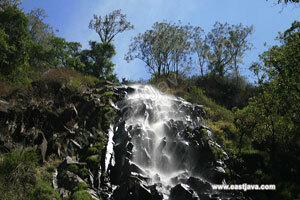 Visit Pundak Kiwo Waterfall In Magetan Tourism, East Java. Enjoy its scenery with your family, friends or the other.